Amazon Kinesis is a real-time streaming data service which makes it easy to collect, process, and analyze. Kinesis offers capabilities of cost-effectively process streaming data at any scale to get timely insights and react quickly to newly generated information. With Kinesis, now you can ingest real-time video, audio, logs, website clickstreams, IoT telemetry data for machine learning, and many more. The Sigma IDE currently supports only the following type of Kinesis resources. A Kinesis stream can be used to trigger a lambda function within a Sigma project. To insert a Kinesis stream as a trigger, a Kinesis resource should be dragged from the resources panel and dropped on top of the event parameter of the lambda handler. Next, the Kinesis topic configuration panel should be used to set a Kinesis stream as the trigger. When a Kinesis stream is configured as a trigger to a Lambda function, that function is invoked each time a record is published to the defined stream. The structure of trigger event received by Lambda function is of the following format. Kinesis triggers have the following trigger specific parameters. Batch size: The largest number of records that will be read from your stream at once. 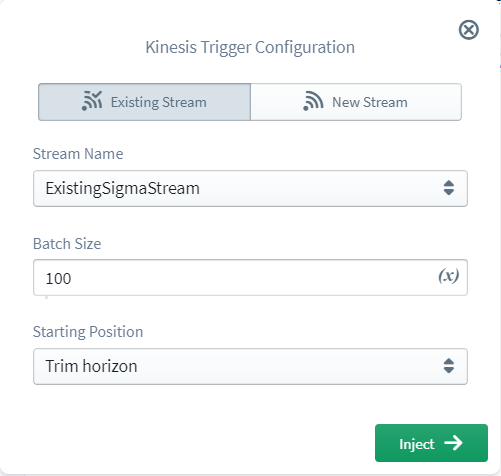 In Kinesis stream configuration panel, it is possible either to select an existing Kinesis stream or to define a new stream. To select an existing stream, first go to the Existing Stream tab of the configuration panel. Then, under the Stream Name you will be able to select the required stream from the list of streams you already own in your AWS account under your current project region. To define a new stream, first go to the New Stream tab of the configuration panel. Then a Stream Name should be provided, and this stream name must be non-empty and should contain only alphanumeric characters, hyphens (-), periods (. ), or underscores (_). 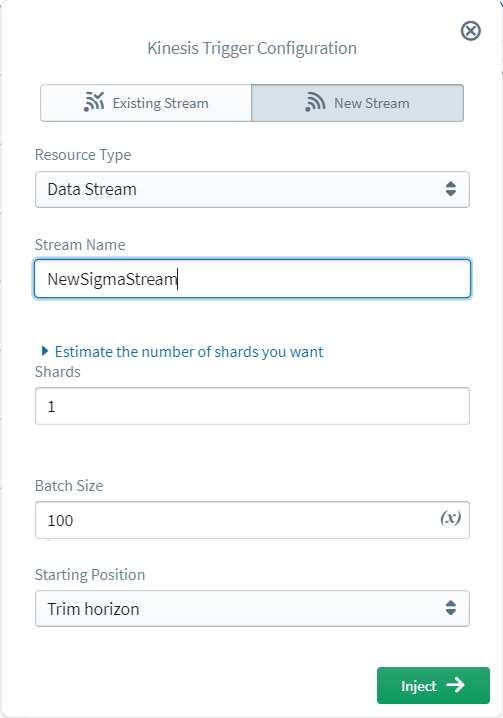 Then, provide a positive integer within the shard limit for your account under Shards. To request an increase in the shard limit of your account, use Kinesis Data Stream Limits form. Kinesis Data Stream type resources can be used inside Lambda to perform operations on streams. To auto-generate relevant code snippet for the operation you desire, simply drag a Kinesis resource from the resources panel and drop on the required line in editor. When a new Kinesis stream is dragged and dropped into the editor, first the resource mode should be selected depending on it&apos;s an existing one or a new one and configured. Once the stream configuration is done, an operation should be selected to inject the code snippet into the editor. Currently Sigma supports the following operations on Kinesis streams. Describe Stream operation can be used to programmatically retrieve the information about the specified Kinesis data stream. The information returned includes the stream name, ARN, creation time, enhanced metric configuration, and shard map. This operation has a limit of 10 transactions per second per account. The fields related to this operation are as follows. Put Record operation can be used to programmatically write a single data record into a Kinesis data stream. This operation sends data into the stream allowing real-time ingestion and subsequent processing, one record at a time. The fields related to this operation are as follows.